We have all heard stories about amazing ideas, products, and policies have come to life from a sketch on the back of a napkin. Or, if you haven’t, you can read about them here, here and here. There is no denying that simple drawings (the noun) are powerful tools for communication, but drawing (the verb) is an even more powerful tool for ideation and problem solving. Introduce our students to the power of drawing for personal idea generation and group idea communication. Confirm our hypothesis that digital drawing is going to change the way we work. This story is about why we did this, and what we learned. We met at a conference last summer where we immediately recognized that we were both working at the intersection of design and business and passionate about visual thinking. 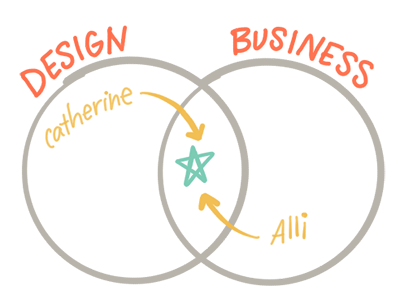 At the time Alli was a business student at Stanford by way of Bain & Co, and Catherine was a designer/consultant at Deloitte. We bonded over our common belief that we can work smarter, faster, and more creatively when we draw our ideas, and over our common goal to eliminate the unfortunate reliance on PowerPoint as the tool to formulate and communicate ideas. We each independently sought to solve this problem first from within our companies, and now through our own businesses. Between the two of us, we have taught visual thinking to hundreds of people in business all over the world. 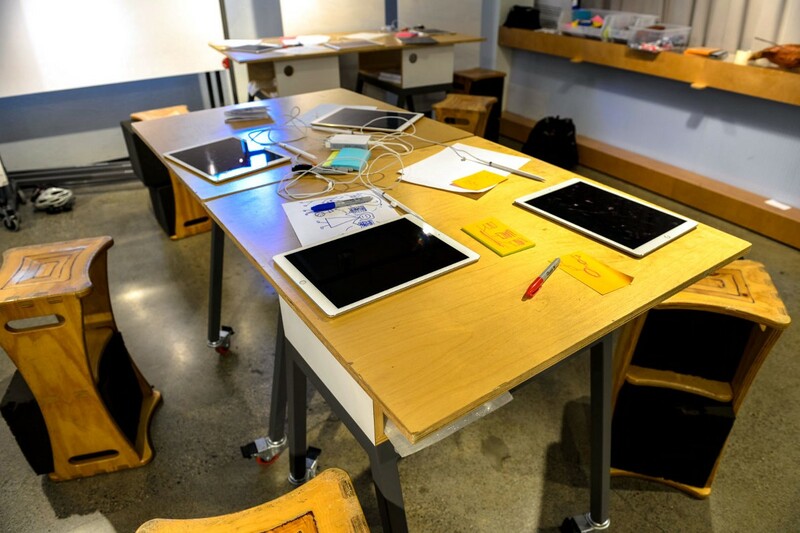 In the past we conducted workshops in the analog format with flip charts, whiteboards, and sticky notes. Student engagement in our trainings always followed a similar pattern: first fear, then hesitation, then cautious experimentation, and finally excitement. As students learned the tricks and the practice of visual language, they saw the potential to change the way they create, communicate, and collaborate. However, after class ended and we returned to business as usual, our students were usually still afraid to draw at work. But drawing at work is becoming more important every day, and not just for designers and creative types. Worlds have collided, driven by increasing speed of business and need for rapid iteration. 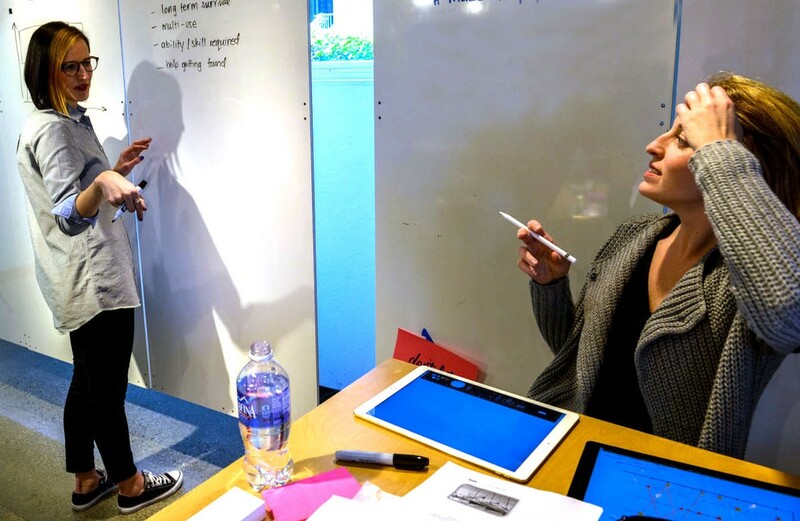 Firms like IDEO have democratized the design process with design thinking methodology, and almost every major company is transforming their business operations to be more agile, iterative, and collaborative. In many businesses today, all contributors are encouraged to think and work like designers. Other thought leaders have touted drawing at work for its ability to generate more efficient meetings and better work products. Despite cultural resistance, the benefits of drawing to create, communicate, and collaborate have only become more powerful in recent years. 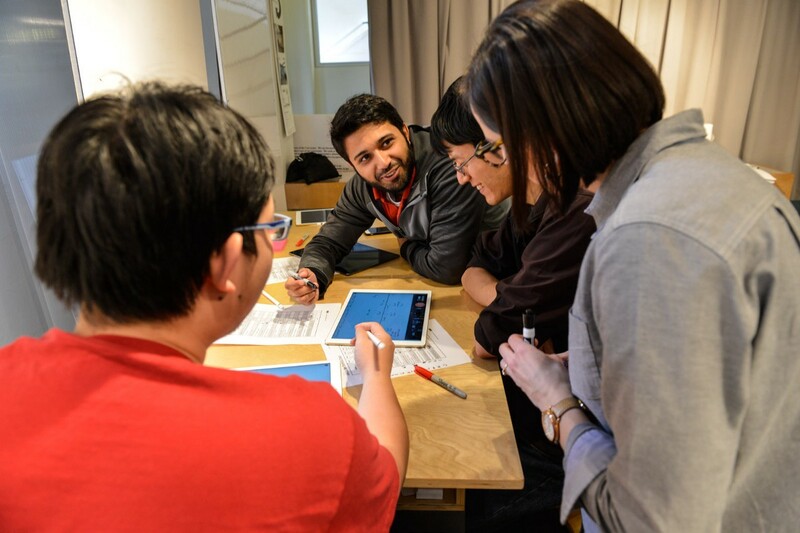 In cross-functional teams, where everyone brings their own understanding of the problem and uses their own technical jargon, drawing and visual language help cut through communication barriers and misunderstandings. People still aren’t drawing at work, for a variety of reasons. The most common excuses we hear are “I’m not artistic” and “I’m not creative”. We don’t need to write another book or article about how that’s not true. Another common excuse is that people are much faster and more efficient in Powerpoint. This may be true, but we would be shocked if a truly original idea or innovative design was generated through the library of “smart art”. Enter digital drawing. Catherine picked up an iPad several years ago, but primarily used it for media and games until downloading Paper to try digital sketchnotes. With the release of new features in Paper like Think Kit, and the continual improvement of Adobe apps like Draw, Comp, and Mix, she found ways to integrate her iPad into as much of her UX and data visualization workflow as possible. We both upgraded to iPad Pro and Apple Pencil last fall and have found tremendous value in using digital drawing for our unique needs. From note taking and organizing content in class, to sketching ideas and capturing feedback with clients, we are hooked. But we wanted to know if the same thing would happen for others. 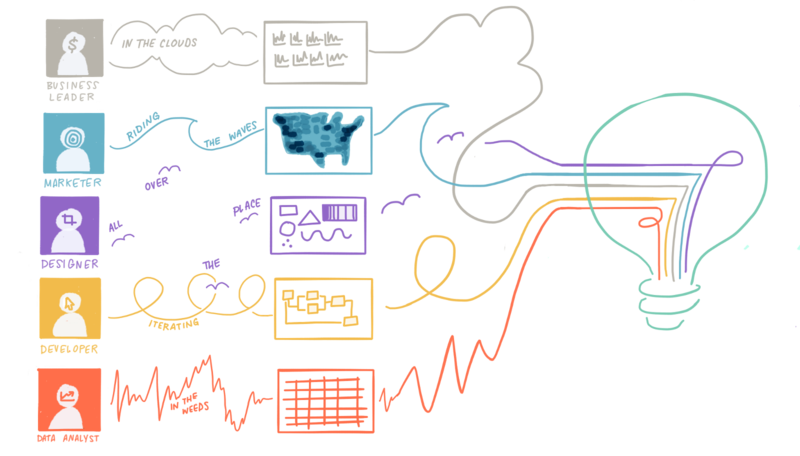 We believe that when you combine visual thinking best practices with the inherent benefits of digital drawing, it has the potential to change the game for people of all backgrounds in a variety of careers. This is what we ultimately sought to bring to our students in the Visual Communication for Groups workshop, where we expected to observe three core benefits: confidence, creativity, and collaboration. 1. Drawing digitally builds confidence. It is understandably common for people to be uncomfortable drawing pictures to present to their bosses or colleagues. The students in our workshop had varying skill levels, from software and electrical engineers to visual artists, and virtually all of them exhibited some hesitation at first when presenting their analog drawings to the group. Digital drawing is no longer awkward or unnatural, and with apps like Paper, even the least steady hand can draw clean lines. With what is essentially auto-correct for drawing, our students’ ideas began to take shape more clearly. Even the least comfortable drawers were delighted to see their roughly drawn circles snap into clean ones. With the ability to rewind, duplicate, and trace, they were no longer hampered by their self-perceived creative limitations, and they couldn’t wait to share their drawings with their teams. 2. Drawing digitally boosts creativity. It is commonly written that creatives and inventors who achieve great success do so because they produce massive volumes of work. With the ability to duplicate elements of a drawing as well as entire collections, the process of iteration, refinement, and new idea generation is much faster. We warmed students up to the idea of quantity over quality through a series of digital sketching exercises that encouraged them to generate as many drawings as possible in a short period of time. At first we focused on translating analog drawing techniques to digital (i.e. the visual alphabet), but as we gradually introduced features and advantages of the digital format we noticed students becoming completely engrossed their own experimentation. Once students has more confidence and their creative juices were flowing, we presented a design challenge and asked them to use visual thinking techniques to collaborate and come up with a solution. 3. Digital Drawing improves collaboration. (In theory). If you build a polished prototype others will see flaws. If you build a rough prototype, they will see potential. Drawings are a surprisingly effective medium for collaboration, which was a central concept to our workshop. It is much easier to focus on the overall vision for a product and provide feedback towards what really matters when you are looking at a sketch of an idea as opposed to something more refined. If you show someone a drawing of your idea they will be more inclined help you improve it. After giving each student several hours to learn and experiment with digital drawing, we divided the groups into teams and presented a design challenge. We expected the groups to continue to use the tools they had just learned, but were surprised 15 minutes later when most iPads sat on the tabletops in power save mode. The students had ditched the fancy technology for sticky notes, whiteboards, and markers. During our workshop de-brief we asked students about their approach. 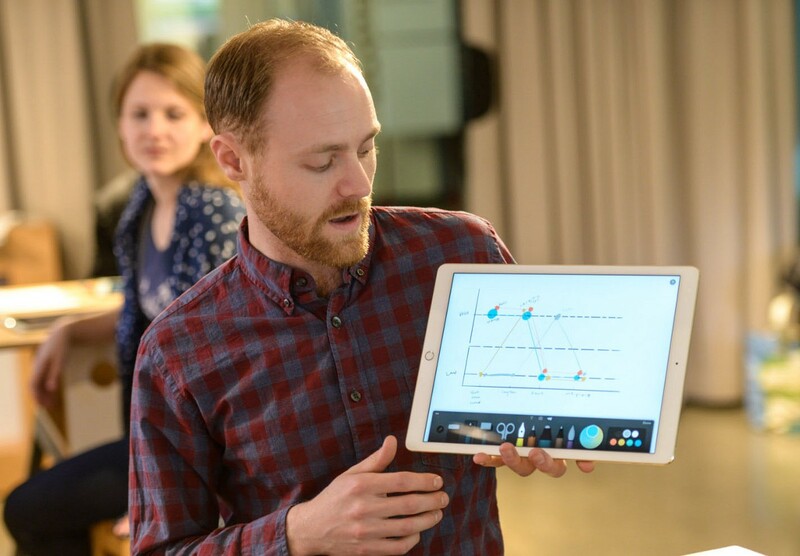 Their feedback was that iPad is a fantastic tool and workspace for exploration and more personal ideation, but when presented with a tight deadline, new team members, and many moving parts it can be easier to throw all ideas onto a whiteboard. Group brainstorming and collaboration is an area where digital drawing and analog need to work together, and where there is the most opportunity to improve the status quo. We are excited to see how things evolve with Paper and other virtual collaboration technology, as most groups don’t have the luxury to solve all of their problems through in-person brainstorming sessions. Companies like Mural and InVision are chipping away at this problem, but what we really hope to see is a shared workspace that has all of the great features of Paper where anyone (from any iPad or other device) can contribute… just like a whiteboard. iPad Pro and Apple Pencil are only as powerful as a user decides to make it. There is no set of best practices or out-of-the-box processes that will work for everyone— with each user comes potential and unique needs that can be unwrapped and met through the right combination of apps and workflows. Those who are curious and reject the default ways of working will find tremendous value and see lasting changes in their capacity to think and create. Design. Drawing. Data. Digital. DC -> SF. Visual everything. *Not* a perfectionist.